My intention for this website is to share my passion for the k1 with you or bring it back to your mind. This bizarre, quite rare and technically unique milestone from the beginning fascinated me. According to the BMW press release in 1989 the k1 was the brand new 4-valve top model of the K-series after a 100.000 of the well-known "flying brick" 2-valve K-models been sold since 1984.
as well as the iconic boxers; R100RS, R90S, R80G/S, R80ST, R65LS, etc. the famous R80G/S and “Paris Dakar” and its successors R100GS+ R80GS with paralever (1987-1995). The k1 was in part, developed to achieve a market share of the existing sports bikes segment dominated by Yamaha FZR1000, Honda CBR1000F, Kawasaki ZX-7, ZX-10, Suzuki GSX-R 1100, Bimota Dieci, Triumph Daytona 1000, etc. Due to the existing German commitment of a 100bhp limit for motorcycles in the 1980s a technical alternative was required to take part of the competition on existing sports bikes with up to 145bhp. The k1 was the very first motorcycle featured with an all-enveloping two-piece front mudguard and main fairing, which has been completely developed in a wind tunnel, following the same exhaustive research as experienced by the R100RS in the end of the 70s. BMW has achieved to balance the given performance gap of about 30bhp with an increased aerodynamic feature by creating a class leading drag coefficient of CwxA = 0,335 by the time a value from 0,4 to 0,5 was ordinary. for such an exceptional result! Developed in the mid of Eighties! The k1 - form follows function! 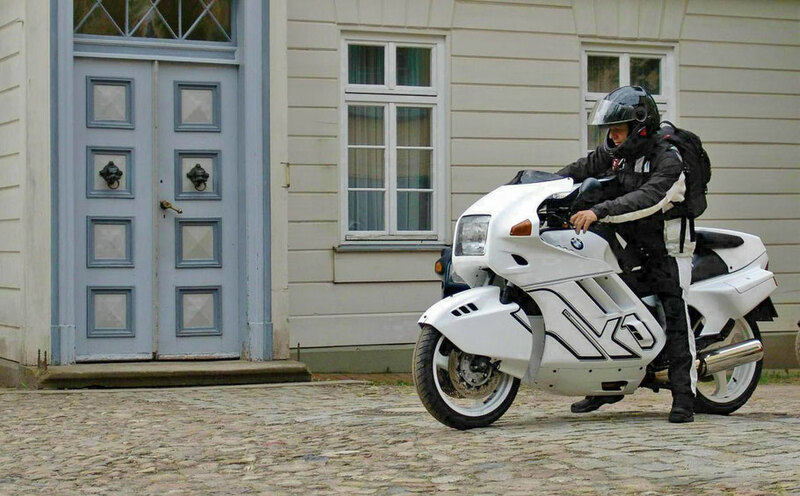 In the Eighties the bikers did neither realize why the k1 looks like that nor see their advantages. The unfamiliar wind tunnel design of the k1 did not get the expected echo whether innovative or not. Next to the high price to less people bought the k1 because it was to far ahead of the development. the k1 remains the most memorable BMW milestone to me. Even after decades it is still a pleasure to ride the k1 and I appreciate it's advantages very much.